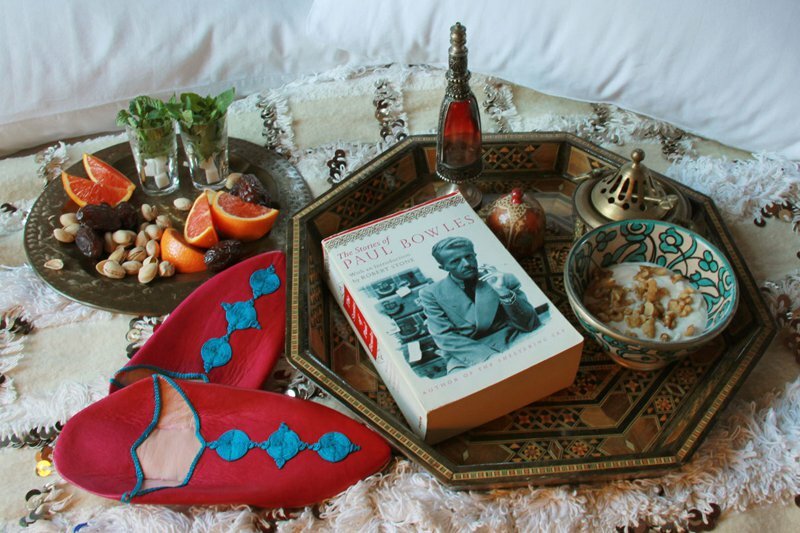 Chances are slim that you can pull off a Moroccan escape this weekend. But there's still time to bring the mood of the medina into the bedroom. Here's how. 1. Set the stage by laying out a from Shop L-atitude. 2. Buy or borrow a few and pile with oranges, almonds, pistacchios, and dates. 3. Fill a beautiful bowl with yogurt, , and . 4. Gift a copy of . 5. And a pair of . 5. Make iced tea with fresh mint springs and sugar cubes. Pour them into . 6. Turn on the romance with fresh rose petals and a spritz of . 7. Add in a few bazaar touches: , . 8. A small bottle of Kahina Giving Beauty is liquid gold for face, hands, and hair. 9. Learn a few sweet words in Arabic and French and write them on a small note you can tuck under the pillow. 10. and were filmed in Morocco. Bring one up on your screen as scenery. And relax.